Which Occupiers Scare You More? This is not about which side you take regarding Occupy Wall Street, Occupy Denver or Occupy Big Belch, Arkansas. Some things ought to frighten you more. 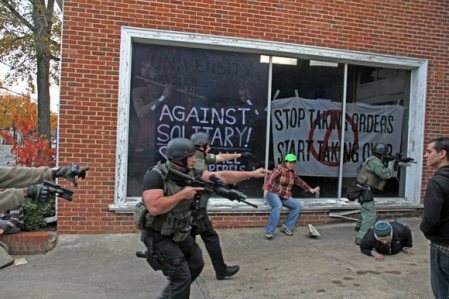 I saw this picture the other day of police dressed in full combat gear dispersing the crowd at Occupy Chapel Hill, home of the University of North Carolina. Such grotesquely excessive displays of power by police have become commonplace in America over the last two decades. The police – along with the FBI, IRS, DEA, DHS, TSA, BATF, etc. – are becoming exactly the kind of occupying army that is so characteristic of places like Guatemala and that the Founders warned us about. I hate to say this, but I seriously believe that a lot of people are just jonesing for some sort of Kent State-type of tragedy at an Occupy rally* if for no other reason to prove a sick and totally twisted political point about the righteousness of their chosen side. Who cares if innocent people have to die? Ya can’t make an omelet without breaking a few eggs, ya know. 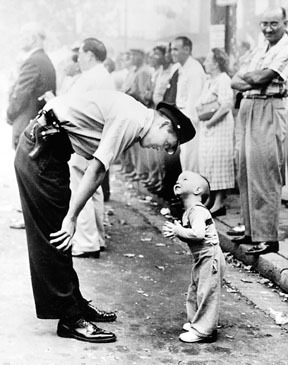 We have degenerated so far from the America of 1958, when the police could be counted on “To Serve and Protect.” This picture won a Pulitzer for photography. Contrast this with the picture that won the Pulitzer for the year 2000. When I saw this, I said something to this effect: If this happened in America, lots of people would justify the killing. (I said other words too.) This should scare you way more than either the Occupiers or the police. The Occupiers occupy a few square blocks – or, in many cases, a few square acres – of their respective cities. The cops are part of a larger army that occupies from Maine to Hawaii. The biggest threat to our liberty in America comes neither from the caves of Afghanistan or from Washington, D.C. It comes rather from the millions of Americans who will rationalize tyranny when it is inflicted on others. They fail to realize is that when they casually disregard the rights of others, they put their own liberty at grave risk. * Thanks to Steven Yates for providing me this link. It goes into much further detail on this matter than I have time for. If you would like to post this elsewhere, please email me and include a link to the following URL. Thanks! 2 Responses to Which Occupiers Scare You More?